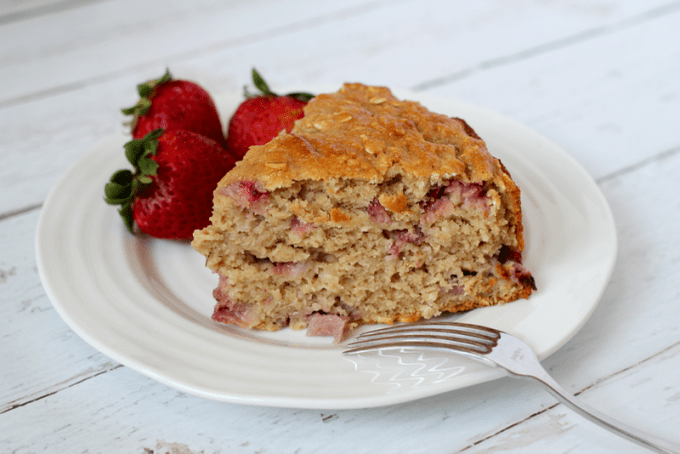 This strawberry yogurt cake is luscious and deliciously light (with no butter or oil) and perfect for a spring or summer dessert! Serve as is or top with a cream cheese frosting or vanilla glaze. So bright, so juicy, so sweet. We buy them in large quantities, go pick them straight from the fields, and generally try and consume as many as possible while they are at their peak. It means I can have a piece as big as my face and not feel one smidge bad about it. Even if I’m having that ginormous piece of cake for breakfast. And again for afternoon snack. And maybe another sliver for dessert. This cake is really easy, too. Just mix up the dry, the wet, combine and fold in those pretty strawberries. Then pop it in the oven and wait for the magic to happen. And enjoy the wafting aroma of homemade cake cause it smells heavenly as it bakes! 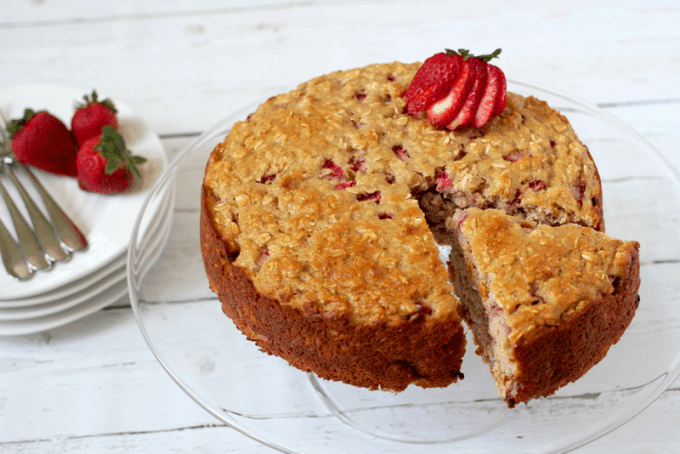 This strawberry yogurt cake makes a wonderful light dessert in spring and summer all on its own. Make a cream cheese frosting to ice the cake. Top it with some sweetened Greek yogurt or a drizzle of vanilla glaze. Drizzle individual pieces with honey or some melted chocolate. 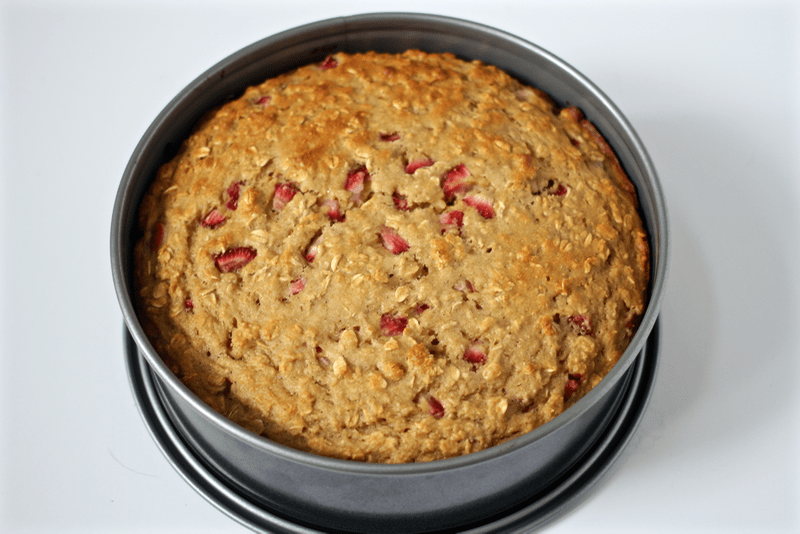 An easy, healthy strawberry yogurt cake. Dive into the freshness with your fork and enjoy! P.S. Are you overloaded with strawberries too? Check out my strawberry oat bread with chocolate chips and my easy freezer strawberry jam, naturally sweetened with honey. They both freeze great so you can enjoy strawberries long after the season ends! Luscious and deliciously light strawberry yogurt cake made without any butter or oil! Preheat the oven to 350. Spray a 9-inch round springform cake pan with cooking spray and set aside. 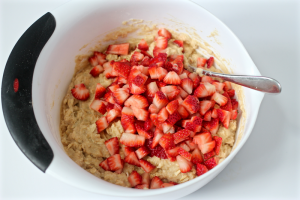 In a large bowl, whisk together the flour, oats, sugar, baking powder, baking soda and salt. In a separate bowl, whisk together the yogurt, applesauce, vanilla and eggs until well combined. Make a well in the bowl of the dry ingredients and add the wet ingredients. Stir to combine but don’t over mix. Fold in the strawberries but again, be careful not to over mix. 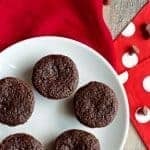 Pour the batter into the pan and bake at 350 for 45-55 minutes, until golden brown and a toothpick inserted in the center comes out clean. After the first couple of days, if it somehow makes it that long in your house, this is best stored in the fridge. I know, right, Amanda? 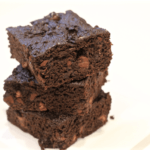 It tastes so moist too – you’d never know! I’ve been overdosing on strawberries this season – they are just so delicious when fresh! I can’t wait to try this but I have a quick question. Step 2 mentions cinnamon but there it is not noted in the ingredients. How much should I use? Thanks for noticing that, Helen! 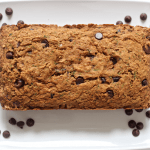 There’s no cinnamon used here – I’ve updated the recipe instructions to take that out. Hope you make it and love it! This is genius – I love that it’s free. Yoghurt is one of my favourite baking ingredients because it gives cakes such a wonderful texture. Yum! Thanks Sammie! 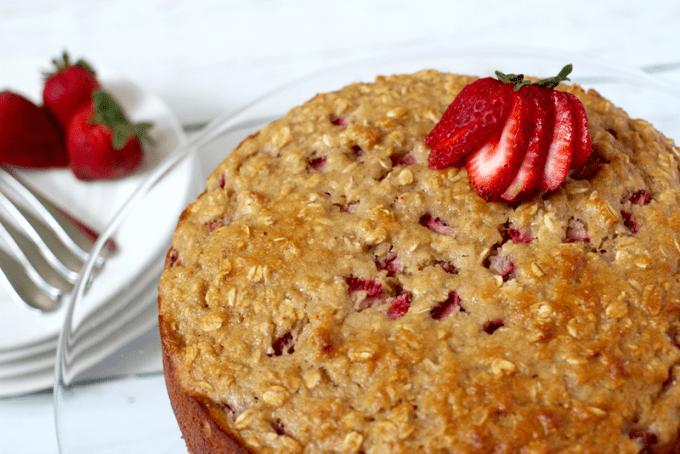 I know, I love what yogurt will do to a baked good and it just goes so well with strawberries… hope you give it a try! Thanks for stopping by! Ooh I love a cake I can eat all day guilt free! 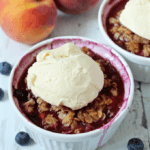 Thanks for linking up with us for Fabulous Foodie Fridays, I hope you have a great weekend! Me too! I seriously chow down on this ALL day long 😉 Thanks for hosting a lovely party! Happy weekend! 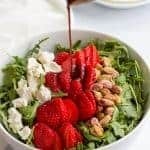 We are literally overflowing with strawberries in our neck of the woods at the moment, so I’ve been scouring for new recipes to try. I love the addition of yoghurt – my kids will adore this. Thanks! Thanks for stopping by, Sam! 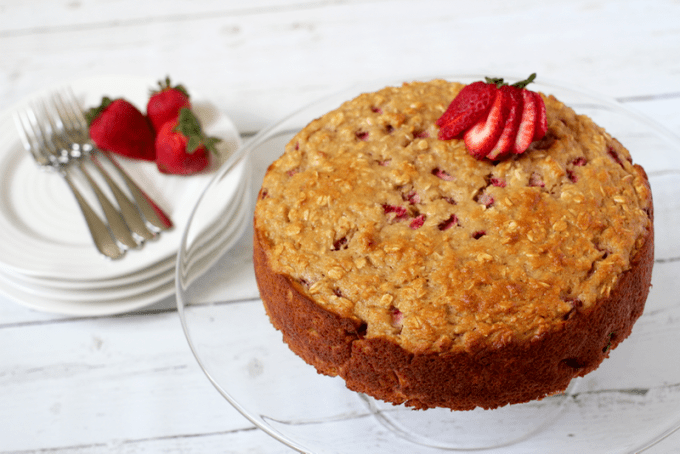 This is such a lovely little cake and a great use for all those strawberries! Hope you give it a try and let me know how you like it! Just stumbled upon this on Instagram and it looks devine. I just have a quick question. Is there anyway that I could cut back on the sugar. 1 cup seems like a lot. Hi Kim! 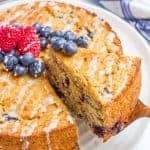 Yes, you can certainly try this cake with 3/4 cup of sugar. Especially if you have ripe strawberries, it will be plenty sweet. And if you want to try it with just 1/2 cup sugar, I’d suggest increasing the amount of applesauce a bit to add a hint more natural sweetness. Would love to hear if you give it a try!